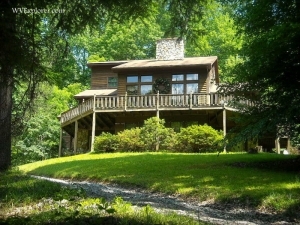 The following cabins and lodge accommodations are located in Summersville, West Virginia (WV), or within a drive of 30 minutes of Summersville. Cottages and condos may also be included here. Our modern cabins sleep two-to-twelve and include full kitchens, two baths, two bedrooms with queen-sized beds, living areas with queen sofa-beds, and sleeping lofts with two twin beds. Amenities include WiFi, washers, dryers, and six-person hot tubs. Hotels and other lodging accommodations may be found elsewhere near Summersville, West Virginia. Please let us know of other Summersville cabins and lodge accommodations that are not listed here.